New York City once was the capital of the United States. 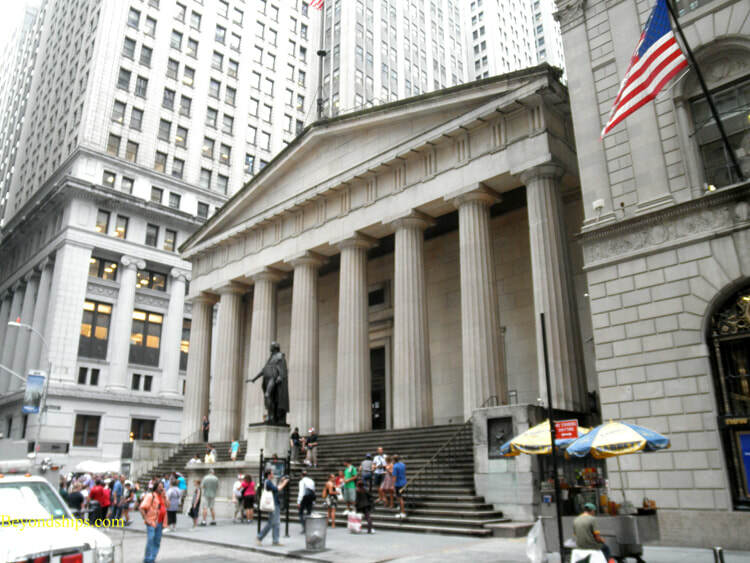 Above: Federal Hall in lower Manhattan. The Bill of Rights was written on this site and George Washington was inaugurated as the first President of the United States here. The first ship to visit New York Harbor was the French ship La Dauphine commanded by Italian explorer Giovanni da Verrazano in 1524. He found the area inhabited by members of the Algonquin nation of Native Americans who used the waterways for hunting and fishing and who engaged in farming. In 1609, Englishman Henry Hudson, sailing in the ship Half Moon on behalf of the Dutch East India Company, arrived in the harbor. He hoped that the river that now bears his name would lead him to China. After finding out that it does not go there, he left but noted that the area was rich in beavers. settlement in 1625, which came to be called Nieuw Amsterdam. The story goes that the Dutch bought Manhattan from the Native Americans for $24 worth of beads and trinkets in what has been termed the greatest real estate deal in history. Some historians, however, argue that the tribe that sold it to the Dutch was probably not the tribe that owned it. possession of the Nieuw Amsterdam colony, which they renamed New York after the Duke of York (later James II) who was then Lord High Admiral. British government following the end of the French and Indian War. The colonists, who were unrepresented in Parliament, resented the government’s imposition of taxes as an imposition on their freedom. The Stamp Act Congress, the first organized resistance, was held in New York in 1765. Recognizing that the British would probably attempt to capture New York City after their defeat in Boston, George Washington brought the Continental Army south to defend New York. The British arrived with the largest armada yet seen and defeated Washington in a series of engagements, most notably the Battle of Long Island. New York remained occupied throughout the rest of the Revolutionary War. Constitution was adopted, New York became the first capital of the United States. It remained the capital until 1790.
successful steamboat, which carried passengers between New York City and Albany, New York. the Erie Canal, which connected the city to the Great Lakes and the interior of the country. Agricultural products arrived from the west for transshipment and immigrants traveling to the west landed in the city. immigrants, many of whom settled in New York. commercial ties to the South and the poorer classes were concerned that once freed, the former slaves would take all the low-paying jobs. These feelings erupted in the bloody Draft Riots of 1863. At the same time, many New Yorkers strongly supported the Union and New York City regiments fought in some of the war's most grueling battles. During the second half of the 19th Century, the city continued to grow as more waves of immigrants arrived. At the same time, city politics became notoriously corrupt under Tammany Hall. Among those who got their start campaigning against this corruption was future President Theodore Roosevelt, who was a native New Yorker. skyscrapers such as the Flat Iron Building and the later Woolworth Building were constructed. Saint Patrick's Cathedral and the Brooklyn Bridge arrived on the scene. Central Park was sculpted. Until the last years of the 19th Century, New York City had been limited to Manhattan. Areas of the mainland north of Manhattan Island (i.e. the Bronx) were annexed by New York in 1974 and 1895. In 1898, a large area of western Long Island became the Borough of Queens, and Brooklyn, which had been a large independent city, became part of New York City. Similarly, the existing towns and municipalities on Staten Island were abolished and that island was consolidated into New York City. 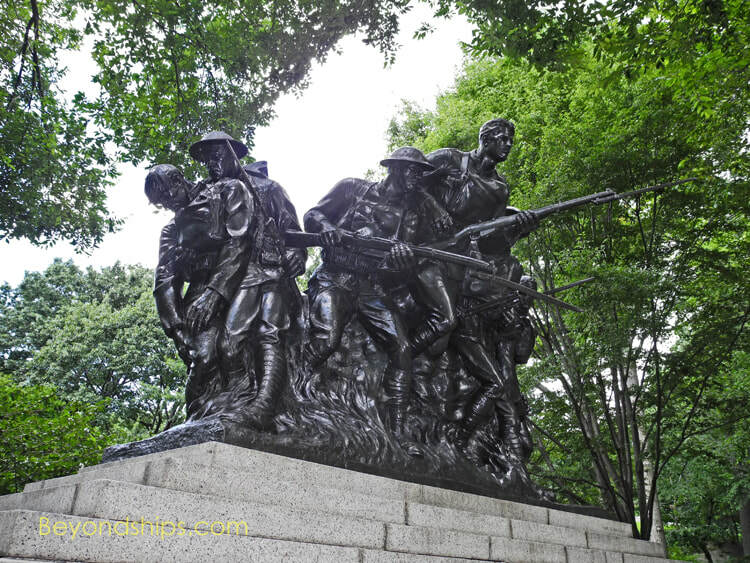 During World War I, New York was an important transshipment point for soldiers and supplies going to Europe. German agents attempted to disrupt these shipments by setting off a mammoth explosion in the harbor which completely obliterated Black Tom Island. Following the war, New York took part in the frenzy of the jazz age as chronicled in the writings of authors such as F. Scott Fitzgerald. George Gershwin was composing Rhapsody in Blue, Broadway was in its heyday and uptown, the Harlem Renaissance was taking place. Normandie and the Queen Mary were sailing regularly from New York. New York again played an important role in World War II. were built at the Brooklyn Navy Yard. economic boom. 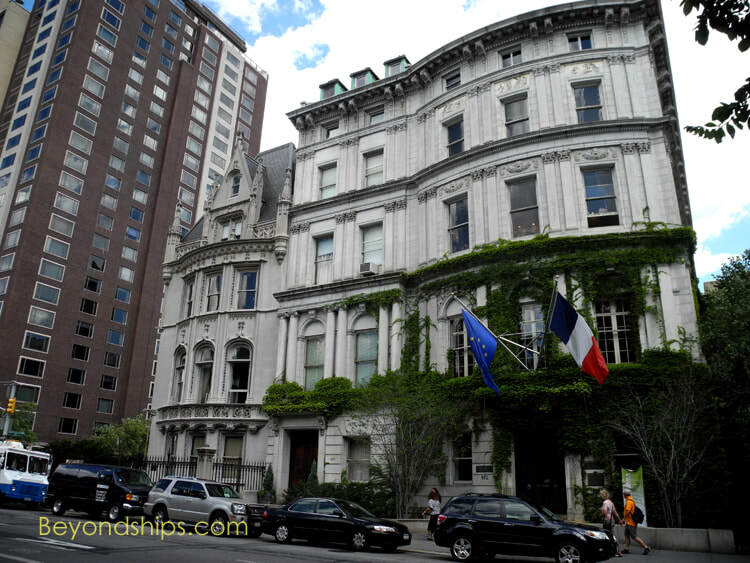 It also became the site of the headquarters of the United Nations and the homeport for the world's fastest passenger ship, the SS United States. financial crisis led to cutbacks in police and city services, which caused more businesses to leave. The city became widely-regarded as un-governable. In the late 1980s, the economic climate began to improve. Rudolph Giuliani was elected mayor, pressing quality of life issues and engaging in a tough anti-crime campaign. Although these measures were controversial at the time, the character of the City changed radically. 2001, when terrorists attacked the World Trade Center, killing nearly 3,000 people. been converted to other uses or have been neglected. Above: A tug pushes a barge across the harbor. 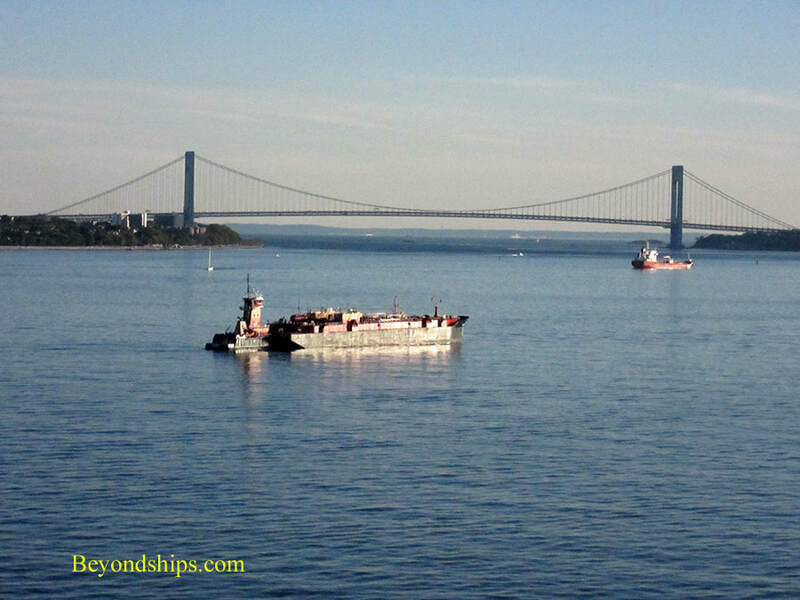 The Verrazano Narrows Bridge at the entrance to the harbor stands in the background. 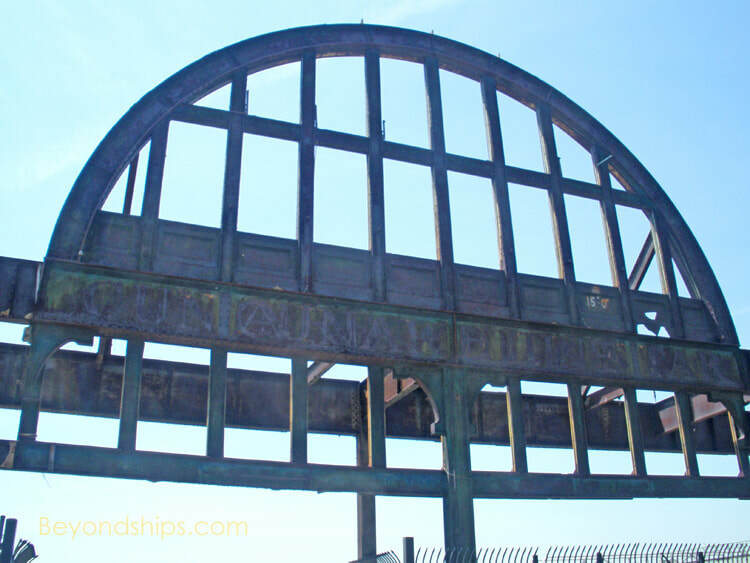 Below: The remains of a Hudson River pier once used by the Cunard liners such as Lusitania. immigrants who worked in the city's Garment District. Tecumseh Sherman by Augustus Saint-Gaudens, above. 107th, a New York National Guard regiment). 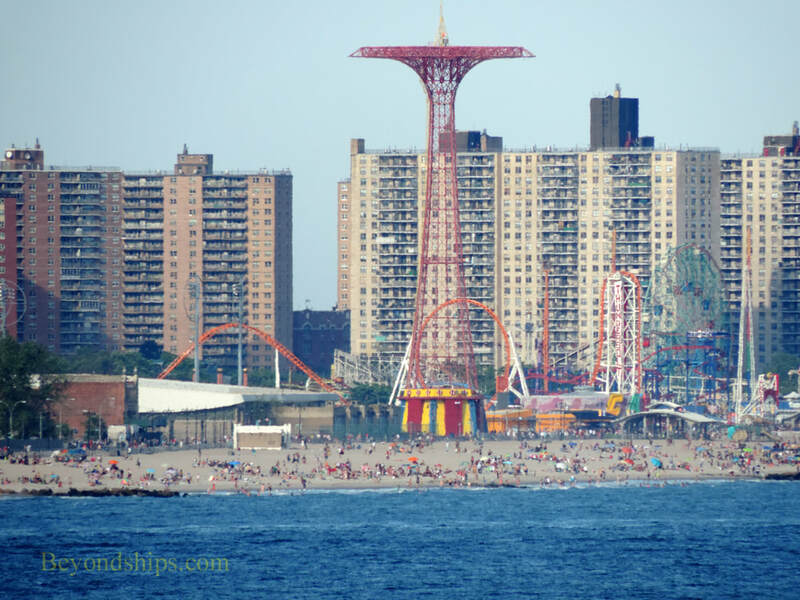 Above: A Brooklyn landmark - - the Coney Island Parachute Jump was a popular amusement park ride in the 1940s. 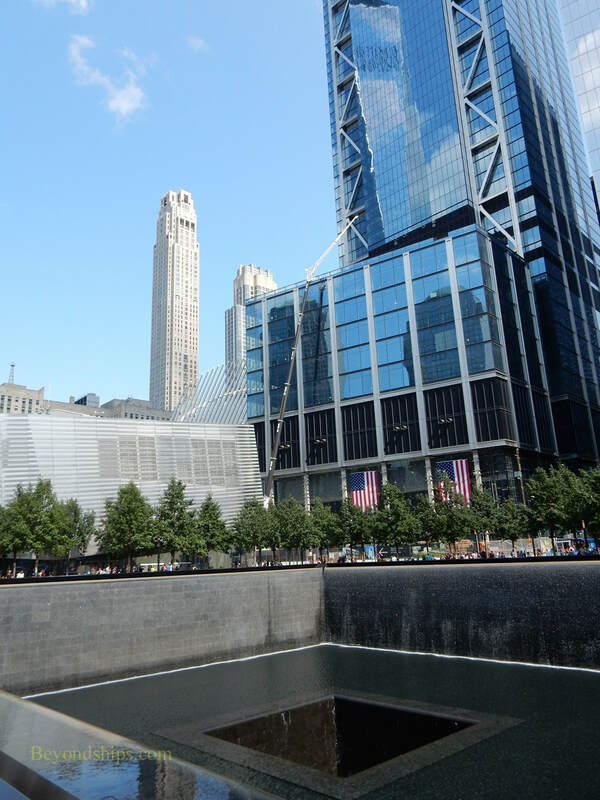 Below: The National September 11 memorial.